This tutorial shows you how to install multiple versions of PHP on Ubuntu 16.04/Ubuntu 17.10 and let a particular Apache virtual host or Nginx server block use one of them. This is useful when you have multiple web applications on your server but one or two of them isn’t compatible with the PHP version in the default Ubuntu repository. 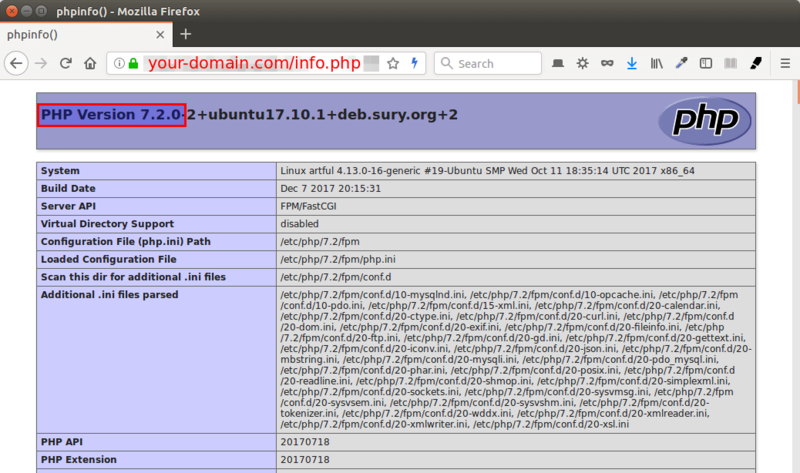 Ubuntu 16.04 repository includes PHP7.0 and Ubuntu 17.10 repository includes PHP7.1. We will see how to install PHP5.6, PHP7.0, PHP7.1 and PHP7.2 on a single Ubuntu 16.04/17.10 server. The easiest way to install multiple versions of PHP is by using the PPA from Ondřej Surý, who is also the maintainer of certbot PPA. To add this PPA, run the following commands in terminal. The software-properties-common package is needed if you want to install software from PPA. It’s installed automatically on Ubuntu desktop, but might be missing on your Ubuntu server. Now you can install PHP7.2 on Ubuntu 16.04/17.10 by executing the following command. And install some common PHP7.2 extensions. You can view all available PHP7.2 extensions by typing in sudo apt install php7.2 and pressing Tab key twice. Install some common PHP7.1 extensions. You can install PHP7.0 and PHP5.6 in the same way. Simply replace the version number in these commands. By default, Apache uses one PHP version across all virtual hosts. 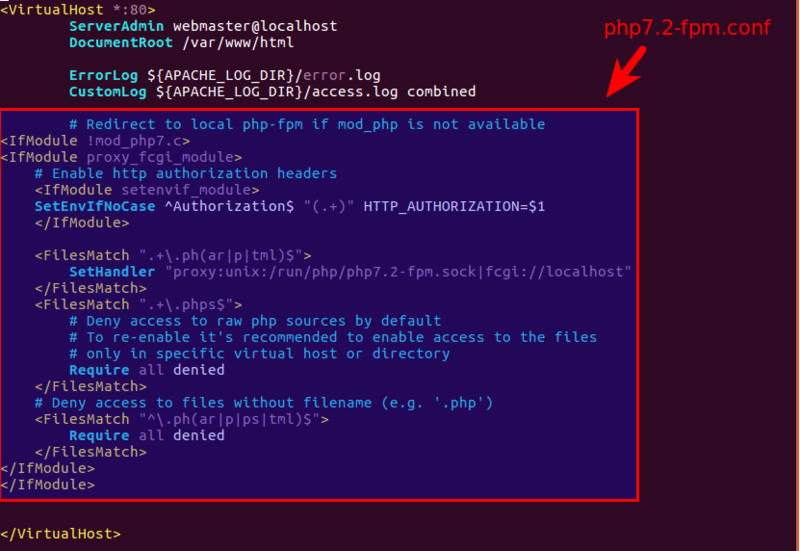 If you want to use different PHP version in a particular virtual host, you will need to disable Apache PHP module and run PHP code via PHP-FPM. Check if mod_php is installed. You also need to disable the prefork MPM module. Now you need to run the following command to enable three modules in order to use PHP-FPM, regardless of whether mod_php is installed on your server. The PHP-FPM configuration snippet is located at /etc/apache2/conf-available/. Let’s say you want to use PHP7.2 in your WordPress virtual host, then just copy everything in php7.2-fpm.conf and paste them in your WordPress virtual host configuration file between <VirtualHost> tags. So your virtual host config file looks like below. Save and close the file. Restart Apache for the change to take effect. Now let’s say you want to use PHP7.1 in Mautic virtual host because Mautic isn’t compatible with PHP7.2, then just copy everything in php7.1-fpm.conf and paste them in your Mautic virtual host between <VirtualHost> tags and then restart Apache. To test which PHP version is used by your virtual host, you can create a info.php file in your document root (let’s say /var/www/html). It’s very easy to switch PHP version in Nginx server block. As you probably know, Nginx runs PHP code via PHP-FPM, which listens on a Unix socket. The socket file is located in /run/php/ directory. As you can see from the screenshot, there are four PHP-FPM socket files on my server corresponding to different PHP versions. Your Nginx server block file typically has the following snippet to connect to PHP-FPM server. I’m sure you get the idea now. Save and close the file. Then reload Nginx for the changes to take effect. To test which PHP version is used by your server block, you can create a info.php file in your document root (let’s say /var/www/html). That’s it! I hope this tutorial helped you run multiple PHP versions on Ubuntu 16.04/Ubuntu 17.10 with Apache and Nginx. As always, if you found this post useful, then subscribe to our free newsletter or follow us on Google+, Twitter or like our Facebook page. Thanks, this works fine. I’m a novice but got it working simple enough. Cheers. Would the process be the same for 18.04? Yes. Also works on Ubuntu 18.04.